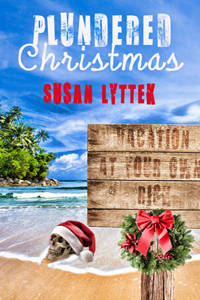 blurb: When compelled to spend Christmas on the private island of her father’s intended bride, Jeanine must cope with pirate legends, unexpected storms, and murder. Will she and her family discover the truth about Anne Bonny’s connection to the Banet family before someone else winds up dead? Back cover blurb: Compelled to spend Christmas on a private island with her father’s future bride and family, Jeanine learns that Margo Banet is descended from a pirate queen. This was an odd Christmas. At least I had my family around me. We negotiated our way back to the house as soon as allowed. As we went around the bend closest to the front door, I saw something blue in the bushes. It seemed the wrong color for any storm debris, so I maneuvered over. As I got closer, the blue became more obviously blue jeans. Why would someone leave a pair of pants out here? Another step and I saw shoes, sandals, below the jeans with feet in them. And on the other end, a polo shirt with arms attached. I dropped my coffee cup in the mud. They mulled over what I said and agreed to do it my way. They would have done it if I laid down the “mom” card, but I liked it better if they could come to that conclusion on their own based on logic. Jelly barked, and tried to lunge for the sandaled foot, but followed his lead when Justin and Josie took him back to the house. I was left outside with the very still person. It looked like a man, but the face was obscured by the position of the bushes. With leaves and branches draped over his legs, I doubted his health. The situation reminded me a lot of the time in the graveyard by our home in Gentle Springs. There, too, I had to stand next to a corpse while I waited for the police to show up. Then, I didn’t know who would give me the third degree. Here, I waited on James. I guess I preferred this scenario. But the past, being over and done with, always seems easier somehow. Why did it take James so long? And was it my imagination, or was a new storm brewing? The wind swirled around my legs, twisting my pants close to my skin. The air felt chill and damp. It ate through everything like it was personal. I wrapped my arms around myself, trying for warmth both physical and emotional. How I loved the sound of that voice. I turned to see James walking out of the house. With him was my very bleary-eyed father. I knew Dad had tried to stay awake for Margo during the night. But I imagined James didn’t want to be the sole witness to whatever I had discovered. I pointed to the legs in the bushes behind me. I just had no words left after all the odd things had been happening. My dream merged with the conversation I had with Margo and the letter became one with the storm. None of it made sense either individually or collectively. Susan A. J. Lyttek, author of kids’ comedy, Guzzy Goofball and the Homeschool Play from Outer Space and the cozy mystery trilogy (soon to be a quartet!) by Harbourlight Books which includes Plundered Christmas, is a wife and the mother of two homeschool graduates who writes early mornings in the shadow of our nation’s capital. She also enjoys training up the next generation of writers by teaching middle and high school co-op classes. Learn more about her and her projects at sajlyttek.com. Author bio Susan A. J. Lyttek, author of kids’ comedy, Guzzy Goofball and the Homeschool Play from Outer Space and the cozy mystery trilogy (soon to be a quartet!) by Harbourlight Books which includes Plundered Christmas, is a wife and the mother of two homeschool graduates who writes early mornings in the shadow of our nation’s capital. She also enjoys training up the next generation of writers by teaching middle and high school co-op classes. Learn more about her and her projects at sajlyttek.com.